Big fan of: His people. Taco is very affectionate with people he knows, and would love to curl up in your lap. He enjoys playing with other dogs his size, but needs a bit of time to warm up to them first. Not a fan of: Strangers. Taco prefers slow introductions to people before he feels comfortable around them. Special features: Taco knows how to use the bathroom outside, but will need some guidance to learn not to go inside, as well. 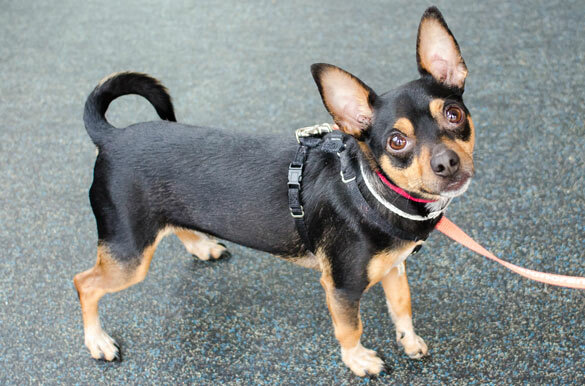 Other reasons he's special: Sweet little Taco was rescued by ASPCA Humane Law Enforcement after being thrown from a moving car. This little dog has come a long way, but still walks with an odd gate due to his residual injuries. He would love to join a loving home. Dream home: Taco would do best with adopters with relevant dog experience. He doesn't feel comfortable around children, so an adults-only home is preferred.